Although it may be difficult to find quick and easy healthy recipes, we are here to help. FaveHealthyRecipes is dedicated to helping you find only the best healthy recipes, and these egg salad recipes fit the bill. So, we’ve compiled a list of 9 Eggcellent Egg Salad Recipes that will be sure to satisfy even the pickiest eater. 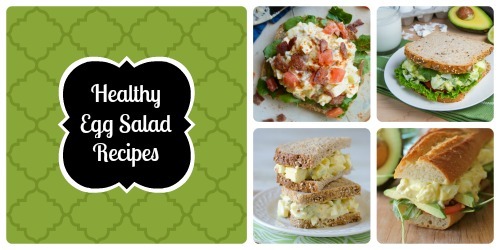 All of these egg salads and egg salad sandwiches are easy to make and yummy to eat. They’re so good that you’ll be want to share these recipes with your friends, family, neighbors, coworkers, and even strangers on the street. These egg salad recipes are too good to keep to yourself. Because these easy egg salad recipes are all so amazing, you'll have trouble picking which one to try first. So, you should save these recipes, and try them all. We are positive that you'll love these healthy recipes. If you like these amazing egg salad recipes, then you should check out these 18 Delicious Deli Salad Recipes. These egg salad recipes will soon become some of your favorite recipes. You'll love that all of these healthy recipes are super easy to make and require just a few ingredients. Because these are such easy recipes, you should make them for your next picnic, potluck, or family gathering. Your friends and family will devour these yummy egg salads, so be sure you make enough. Pop on over to see these 8 Egg Recipes for Healthy Eating. You are going to love these healthy recipes. Even though you may be short on time, we want to urge you to stay away from fast food and take-out. There's no need to resort to these unhealthy meals when you could easily make one of these egg salad sandwich recipes. These recipes take about the same time as fast food, but they are so much better for you. Plus, these healthy sandwiches taste better, too! So, you should make these egg salad sandwiches for lunch tomorrow. Everyone will be jealous when they see what you made for yourself. I'm usually not a big fan of egg salad, but some of these look delicious! Neat list! I never thought about how many ways there are to make egg salad. I'm really curious about the one with guacamole. Ooh, I really like those egg salad sandwich ideas! Thanks for posting!